The park boasts numerous backcountry camping spots: at kilometre 7 (Murray River crossing), at kilometre 13, at kilometre 20 (Cascades), at kilometre 22 (Devils Creek), and at kilometre 25 (Monkman Lake). Each campsite is equipped with a bear cache (to store foodstuffs and gear), a fire ring and pit toilet. Please use these designated areas. There are two tent pads at the Murray river Crossing and eight at the Monkman Lake sites. The km 13 campsite has it has access to water, a fire pit, a bear cache and a few tent spots. Camping at backcountry campsites is on a first-come first-served basis. Campfires are permitted only in designated backcountry campsites. Firewood is in short supply, so please keep fires small for safety and to conserve firewood for the next hiker. Use of Primus-type campstoves is encouraged. Hikers and wilderness campers are encouraged to fill out a volunteer questionnaire giving information as to how many people are in their party, destination, and schedule. Any comments about the park and its amenities are also appreciated. The southeast section of Monkman Park holds several beautiful aquamarine lakes, which are the source of the Murray River. 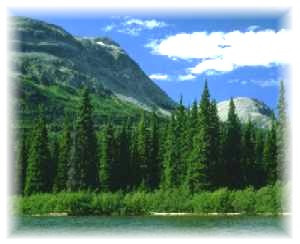 This area of the park is considered to be prime grizzly bear habitat and extensive human intrusion is not encouraged. Recently, the southern boundary of Monkman was extended to include areas with high conservation and recreation features, including the upper Fontoniko Creek, the Limestone Lakes area, and the rolling plateau to the west. This addition protects old-growth spruce forests, unique geological features, and important recreation aspects of the park's terrain, wildlife, and ecosystems. Day Hikes and Backcountry Hikes: Monkman Provincial Park offers a small but attractive selection of short hiking trails, including routes to viewpoints of Kinuseo Falls and the Murray River, a 3-km trail from the main campground to Kinuseo Falls, and the route around the perimeter of a beaver pond. Day hikers wanting more of a stretch can walk the Monkman Lake Trail as far as the Murray River Crossing, an easy hike that is 7 km one way. The Murray River Crossing boasts a suspension bridge, which can lead more serious explorers into the park's interior. 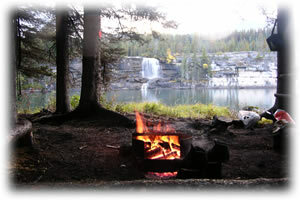 To the south of the Kinuseo Falls campground lies the main body of Monkman Provincial Park. Access is via the 63-km Monkman Lake Trail, which winds through this portion of the park and provides backpackers and hikers with an opportunity to experience the unspoiled splendor of the area. As beautiful as the trail to Monkman Lake is, it passes the most spectacular feature of the park, the Monkman Cascades. These are a series of ten stunning waterfalls along Monkman Creek that thunder over rock ledges separated by placid pools. The trail, which follows the historic Monkman Pass route, ends at Hobies cabin on the Herrick River 10 km beyond the southern boundary of the park. 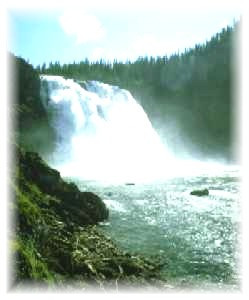 Considered one of the great natural wonders of the province, Kinuseo Falls are a highlight of Monkman Provincial Park. A 42-site campground and day-use area are located nearby in the park. Above the falls, the folding and faulting which occurred with the uplift of the Rockies millions of years ago can be seen as an “S” curve on the far wall. Visitors to Kinuseo Falls will find recreational opportunities such as hiking short trails to viewpoints, as well as many chances to admire the diverse scenery, take photographs, and engage in rewarding nature studies. The campground also provides an ideal base for hikers and campers interested in backcountry adventures.